I have now recruited the most brutal critics on the planet to weed out the sub-standard questions: your students. Students doing revision or homework (though not traditional quizzes) on their iPads etc will see a little ‘bomb’ logo appear in the top right corner of the page. 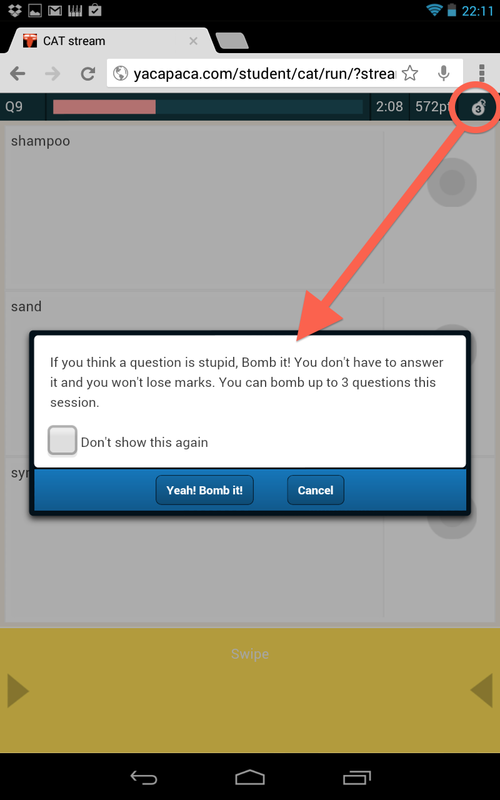 In each session, they are permitted to ‘bomb’ up to three questions. They can use these ‘bombs’ as an alternative to answering any question they don’t like, thus avoiding losing a mark. We count the number of ‘bombs’ for each question, and when that goes over a certain threshold, a human editor will review the question. Of course students will also use bombs to duck out of answer questions that are just too hard for them, but this is not going to affect the homework/revision grade they achieve, and over time I still expect that it is the problem questions that will float to the top of the ‘bombed’ rankings. Like every new Yacapaca feature, this is an experiment. If it works well, we will extend it to the older PC quiz template. And if it doesn’t deliver significant quality improvement – we’ll bomb it! This entry was posted in Yacapaca and tagged assessment, crowdsource, quality, question, quiz, testing, yacapaca. Bookmark the permalink. That is a great idea! Even if you spend ages writing the “perfect” question it doesn’t necessarily generate the answers you’d expect.